The LightCop is a plug-and-play traffic management system that helps reduce forklift accidents with pedestrians. It does this by projecting a large high-resolution LED image onto the open floor or walkways that flashes while workers or forklifts are detected in the area. Just like the flashing lights of an emergency vehicle on the road, or a changing traffic light, the LightCop projection flashing on the ground will clearly grab the attention of anyone in the area. The eye-catching image is a great visual warning in loud factories or warehouses where earplugs prevent workers from hearing an oncoming forklift or a backup warning alarm. The LED provides up to 45,000 hours of use and replaces the need for traditional intersection solutions like floor tape or paint that can peel, chip or wear away over time. 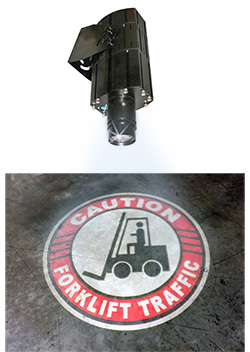 The LightCop system includes the projector with detection sensors, mounting hardware and the glass projection disc that reads "CAUTION FORKLIFT TRAFFIC". Can be activated by an on/off switch. Installing the LightCop projector is as easy as bolting the attached harness to a steel I-beam. Then secure the entire system to the beam using the included tie-off cable - this is a secondary safety measure to prevent the projector from falling. The height at which the projector is mounted will determine the diameter of the projection on the ground. The lens can be rotated in either direction to focus the projection into a clear, crisp image. High intensity LED light is emitted through a glass etched image, also called a gobo, that is then passed through a high definition lens. This provides a very clear warning image projected on the floor. A motion sensor inside the projector continuously scans the area for movement and upon detection will flash the projected image on and off for 15 seconds. When motion is no longer detected by the sensor, the projected image reverts back to the on position.